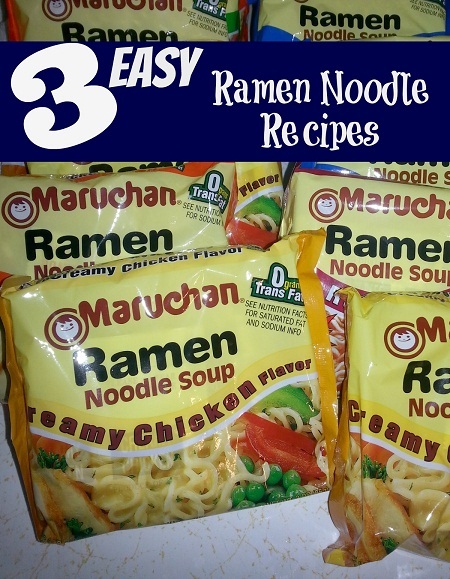 We all remember those crazy college days when Ramen Noodles were a staple in the pantry but as adults we can still make use of them in a sophisticated way with these 3 Easy Ramen Noodle Recipes. Not only are they quick and easy to prepare but they are sure to please the palate of even your picky eaters. Staying in budget and providing a great evening meal on a busy day is important and here is a great way to do so. Cook noodles on stovetop as directed minus the flavor packets. In a large skillet sauté the vegetables in olive oil for 7-10 minutes or until they are tender. Next stir in noodles, sauces and garlic and cook for additional 4-5 minutes or until flavors are blended. Cook noodles on stovetop as directed minus the flavor packets. In large skillet, mix together peanut butter and teriyaki sauce until smooth. Add in shredded chicken and onions cooking for 3-4 minutes. Toss with ramen noodles and serve. Cook noodles on stovetop as directed minus the flavor packets. Drain and set noodles aside. In large skillet cook shrimp 3-4 minutes on each side until cooked through, remove from skillet and toss with noodles. Pour milk, peanut butter, lime, garlic and red pepper flakes into skillet stirring until well blended. Add in green onions and cook on medium heat for 2-3 minutes. Pour over noodles and shrimp and toss until well coated. Think outside the box with ramen noodles and use them as a base for nearly any Asian inspired dish or pasta dish. Add your favorite vegetables and a little teriyaki, soy or fish sauce with broth to create a rich soup or bowl of noodles that is a far cry from the simple packets you consumed as a youth.